Walk into the Merchandise Mart from any entrance and you’ll be greeted by a sculpture. From a cartoon character to animals to food items, these sculptures awe most. But upon further inspection, these sculptures are exceptional in another way; each one is made up of cans. Twenty-four teams competed in the annual CANstruction Chicago exhibition to create these colossal “CANsculptures.” Teams comprised of professionals from the architecture, engineering and construction industry fundraise, design and build structures composed of non-perishable food items. On August 23, the build teams, sponsors and guests gathered for an awards presentation and cocktail reception at the Merchandise Mart to recognize the best structures, as voted by a panel of judges and the general public alike. -People’s Choice: Stomp Out Hunger, Rhinow!- IA Interior Architects and Environmental Systems Design, Inc. This year’s event collected over 150,000 cans of non-perishable food items for the Greater Chicago Food Depository. 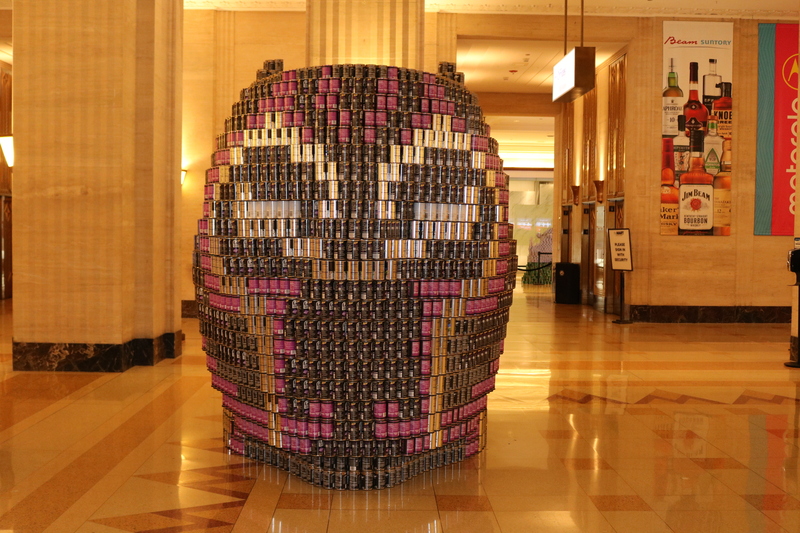 Canstruction Chicago is the Food Depository’s largest one-day food drive of the year. Thank you to our sponsors, Groupon, Merchandise Mart, Penske, AIA Chicago, Primera, Marshall’s Landing, Lagunitas Brewing Co., Kinzie Chophouse, Brizo + Delta – Chicago, Hart Davis Hart Wine Company, Penske Truck Leasing, Primera Engineers, and Rentacrate Enterprises for making this event one of the most successful to date! The “CANsculptures” will be on display for the public on the first floor of the Merchandise Mart until September 10. See photos from this year’s event.